Building, pricing and analyzing even non-standard interest rate swaps in Excel becomes a simple exercise when the Deriscope interface to the open source QuantLib analytics library is employed. We have already encountered a simple interest rate swap contract in the Yield Curve Building in Excel using Swap Rates article, where vanilla swaps were used to build a yield curve. Now I will extend my scope to more complicated fixed-to-floating interest rate swaps whereby an already created yield curve is assumed given. How to price non-standard, over-the-counter interest rate swaps when a yield curve has already been built out of liquid vanilla swap market rates. The following diagram visualizes the various types of fixed-to-floating interest rate swaps that can be priced by QuantLib and created in Excel through Deriscope by utilizing the special Deriscope type Fixed Float Swap. Several more customizations are still possible by employing other more advanced Deriscope types that I plan to cover in subsequent articles. 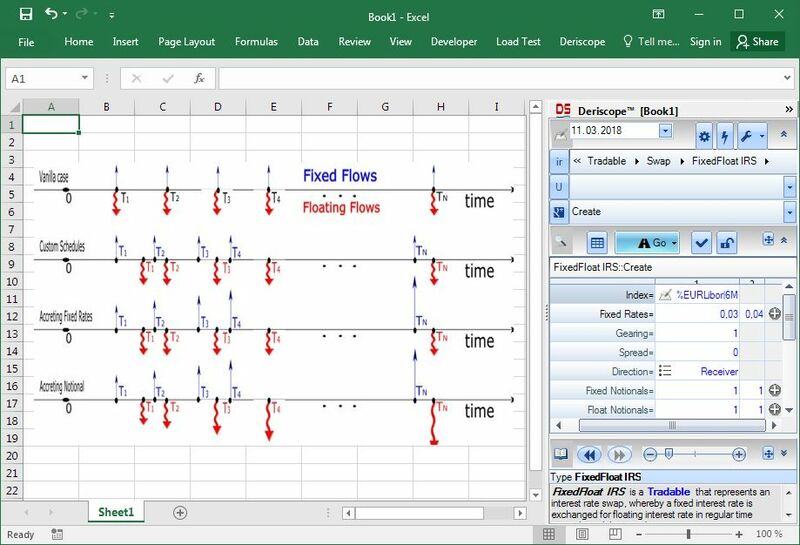 The Deriscope wizard can generate the spreadsheet formula that creates a full-fledged fixed-to-floating interest rate swap object in Excel, as the video below demonstrates. A great wizard feature is its capacity of displaying all implied cash flow data for any given input selection before the final formulas are generated and pasted in the spreadsheet! The prefix & indicates that &SimpleRt_A1:1.1 is the handle name of some object. In fact it points to an object of type Fixed Float IRS. Index %EURLibor|6M The interest rate of which the fixing Fi at the start of the ith floating leg period is used in the formula Ni΄(gFi+s)Δti΄ that produces the amount to be paid at the end of that period. Ni΄ is the floating leg notional at the start of the ith period, g is the gearing, s is the spread and Δti΄ is the length of the respective period. ​Fixed Schedule ​&Schedule_E1:1.1 ​Sets the time schedule of the fixed payments. It also determines the length Δti for each fixed leg interval used in the formula NiRiΔti Ni is the fixed leg notional at the start of the ith period, Ri is the applicable fixed rate and Δti is the length of the respective period. In my case, the object in cell A1 is linked to input data located in adjacent areas so that I do not need the wizard to find out – for example – that the gearing value equals 1. But when I build more complex spreadsheets, handle names such as &FxdFltIRS_A1:1.1 can be found at any cell far away from their original input data. In such cases, the wizard becomes indispensable as it can give me an x-ray picture of the object's contents as soon as I select the cell containing the respective handle name. The following picture shows what the wizard's Browse Area displays when cell A1 is selected. Looking inside the wizard, I cannot only verify that gearing = 1 but I can also browse through deeper details by clicking on the respective lens symbols. As you see, only time information is included in this view. Information on future index fixings is not available because it is impossible to calculate forward fixings without a yield curve input. Cash Flows: Returns the implied cash flows for a given yield curve input. Price: Returns primarily the swap's price for a given yield curve input. The wizard pasted the main formula =ds(A20:B23) in cell A19, which then produced the object of type Variant named &Variant_A19:2.1. The produced object contains the various cash flows that are visible inside the wizard because cell A19 is selected. The Model object includes a key called Forecasting Curve Issuer in cell A30, the value of which is left empty. Because of this, the cash flows are projected by relying on the yield curve supplied in the market data. Deriscope has created the Historical Values object because it recognized that a historical Libor fixing as of 09 Mar 2018 is required, which cannot be implied by the given yield curve that starts two days later on 11 Mar 2018. It therefore creates the necessary formula with a dummy fixing of 4%, which I must replace manually with the actual historical Libor fixing of that date. We saw that the Cash Flows function returns the object &Variant_A19:2.1 in cell A19 and that I can peruse its contents through the wizard. It is also possible to generate a spreadsheet formula that returns all or a portion of these data directly in the spreadsheet. The following video shows how I use the wizard to output the cash flows of the floating leg on a separate sheet. As you see, beyond the cash flows per each leg I can also see the NPV and BPS as well. What I am now going to show you, is perhaps superfluous in the context of the very simple "derivative" that we currently consider, but can be indeed useful in more complex situations. Deriscope makes the actual steps taken throughout the price calculation transparent to the end user! It also makes transparent the various underlying QuantLib structures, methods and intermediate results that are accessed and produced during the run of the calculation. I start by selecting cell H19 containing the swap price, whereupon the wizard displays the sentence "To display the pricing steps click here". As you see, the algorithm that has been executed in order to produce the price of 0,002498617 is described in terms of TASKS and SUBTASKS. All blue color elements act as hyperlinks that either supply object details or take you to a next screen displaying a deeper, more refined level of information. The most useful hyperlink is the here at the top sentence "Click here to jump straight to the FixedFloat IRS pricing algorithm." This acts as a shortcut that skips all intermediate standard workflow and takes me straight to the real stuff, namely the QuantLib pricing routine. In the above picture, I have intentionally highlighted the section telling me that the actually used QuantLib instrument is of type NonstandardSwap, the pricing engine is DiscountingSwapEngine and the function is called NPV. Here I can see how the NonstandardSwap object looks like at the moment when it is actually priced! For example, I notice that the row corresponding to the fixedRate key (referred as fixedRate and not Fixed Rate because this is how it is called in QuantLib) contains 5 rates even though I have supplied only 2 rates as input in my spreadsheet. What happens is that QuantLib carries out some internal processing whereby the original last input rate is replicated enough times in order to cover all fixed leg intervals that are not already covered by the previous input rates. It is wonderful that I can see this degree of detail, especially if I have trouble reconciling my QuantLib pricing output with that obtained by other sources such as Bloomberg! I can peek even deeper within the displayed data.